Located in the enclave of Sunny Isles Beach, this hotel features modern suites, a beach, and a swimming pool. Located just west of downtown Miami, this all-suite boutique hotel features a spa, pool, golf course and a restaurant. Hotel overlooking Biscayne Bay and close to area attractions featuring an outdoor pool & spa, fitness center and dining. Located in the heart of Miami, the sophisticated JW Marriott Marquis features a golf school, spa and three restaurants. The Best Western Miami International Airport features an on-site restaurant & bar and an outdoor swimming pool. Set in the heart of Miami, the Hotel Beaux Arts Miami features complimentary breakfast and a heated outdoor pool. Just outside MIA, Element Miami International Airport is just minutes from downtown Miami and South Beach. 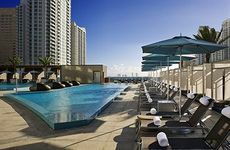 Located in the heart of Miami, the Hampton Inn & Suites Miami Brickell Downtown offers a rooftop pool with poolside bar. This ultra-luxury full service vacation rental property specializes in stays of three nights or more with full kitchens. Located just two miles from the airport, the Residence Inn Miami Airport features complimentary breakfast and internet. b2 Hotel Miami Downtown is a chic and stylish hotel that is just steps from several attractions and Biscayne Bay. Just 15 minutes from Miami Beach, the Regency Hotel is a full service boutique hotel set near the airport. Opening June 2013, this new hotel is located in the financial district and is close to the American Airlines Arena.